ARCATA, CA. — Former Oakland Raiders, Tim Brown, has been named the keynote speaker at the 29th Annual Sports Celebrity Dinner & Auction scheduled to be held on Saturday, March 29, at Humboldt State University in Arcata, California. Don and Carolyn Johnson will be the honored guests this year. Guest speakers in the past have included Rick Barry, Jim Harbaugh, Misty May Traenor, Joe Frazier and Steve Young. There will be 50 live auction items and about 150 silent auction items. Guests will be able to bid on items such as 10 nights in a deluxe home in Maui, two tickets to this year’s NCAA Men’s Basketball Final Four, a 2000 BMW 3 series automobile and sports memorabilia. All funds raised go toward scholarships for student-athletes. Tim Brown played college football for Notre Dame, where he won the Heisman Trophy, becoming the first wide receiver to win the award. He spent sixteen years with the Los Angeles/Oakland Raiders, during which he established himself as one of the NFL’s most prolific wide receivers. 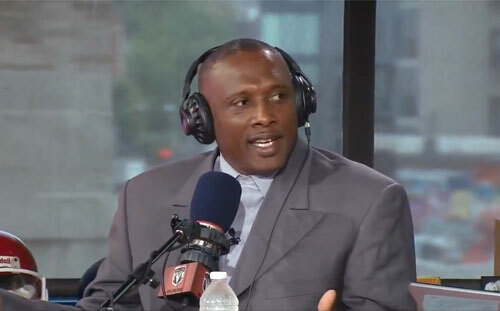 If you would like to book NFL stars like Tim Brown for a speaking engagement, autograph signing, product endorsement, fundraiser or special event, contact Tim Brown’s booking agent for appearance and speaker fees at Sports Speakers 360. For booking agent and appearance fee information on how to hire Oakland Raiders players for appearances, call 1.855.303.5450.